This Talavera water dispenser jug will bring the bold colorful tradition of Mexico and the southwest to your kitchen or outdoor gathering. These ceramic water dispensers are a great accent for your southwest, Santa Fe, Spanish colonial, or Tuscan d�cor. Our Talavera accessories are all carefully handmade and hand painted by talented Mexican potters. 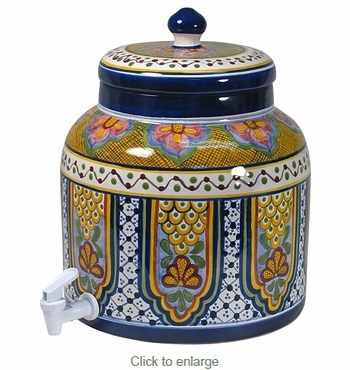 Design Assortment: The water dispenser shown is of the traditional Talavera style. Your vase will be chosen from our current assortment of available designs. The item you receive may be different than the one pictured here. 13.25" Tall x 10.875" Dia. Medium Talavera Sun Face - 13.5" Dia.